Slaughter and May’s international arbitration practice grew out of contentious work done by the firm in the 1980s, notably work on a case relating to the high-profile Westland Helicopters affair that split Margaret Thatcher’s cabinet. In the following decade, it advised Standard Chartered Bank in matters arising from the Bombay Stock Market scandal when employees from the bank’s Mumbai office illegally diverted funds to speculate. Two key figures in the practice, Nick Archer and Nick Gray, retired from the firm in 2015 and 2017 respectively. 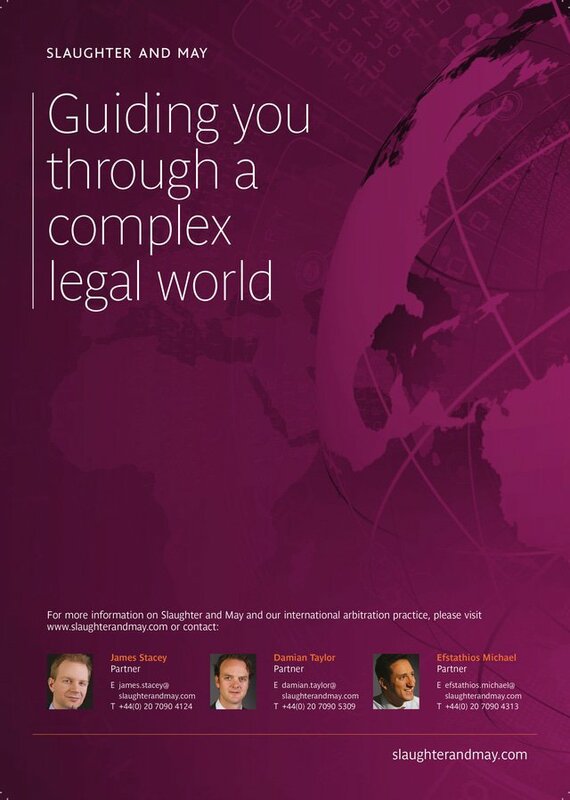 The practice is now co-led by James Stacey and recently promoted partner Damian Taylor, who is working on developing the firm’s Africa practice. Other names to know in London are Efstathios Michael and Richard Swallow. The firm prides itself on eschewing the “star” culture of many arbitration groups, instead providing the right team for the job drawn from nine partners who practise in this area and its “best friends” network. It makes regular use of barristers. Slaughter and May works in conjunction with a group of five other European firms. The “best friends” network includes Italy’s BonelliErede, France’s Bredin Prat, Dutch firm De Brauw Blackstone Westbroek, Germany’s Hengeler Mueller and Spain’s Uría Menéndez – all of whom feature in the GAR 100. The network has 32 offices in 15 jurisdictions. In Asia, Slaughter and May was the first City firm to establish a presence in Hong Kong, in 1974. It also has an office in Beijing, which opened in 2009. Arbitration work in the region is led by partner Mark Hughes. In Europe, it has offices in London and Brussels. Slaughter and May was said in one 2017 guide to advise more London Stock Market, FTSE 100 and FTSE 250 clients than any other firm in the UK but it is reluctant to name names. Clients that are on the record include the UK’s Standard Chartered Bank, Kazakhstan’s ForteBank (formerly known as Alliance Bank), German power utility RWE, Spain’s Repsol, Swedish financial group SEB, Sociedade de Fomento Industrial (a major Indian exporter of iron ore), Cable & Wireless, Orange, Kosmos Energy, Siemens and Rolls-Royce. In 2015, the firm helped RWE to settle a multibillion-dollar LCIA arbitration against the UAE’s Dana Gas and Crescent Petroleum. The dispute, which related to operations in Iraqi Kurdistan, was described by The American Lawyer as the largest contract-based arbitration in the world. The firm also advised RWE in its successful defence of a US$1.4 billion claim by Russia’s Sintez Group. The firm earned a “disputes deal of the year” award from India Business Law Journal in 2012 after it won an ICC award for Indian ore exporter SFI in a dispute with state-owned Pakistan Steel Mills Corporation that raised challenging economic and political issues. It also helped to enforce the award in Canada. It represented ForteBank, one of Kazakhstan’s largest banks, in a billion-dollar fraud claim against former shareholders that played out in English court litigation and related arbitrations. As part of that dispute, the firm obtained the enforcement of a US$600 million LCIA award in the Cypriot courts. Slaughter and May helped Malaysia’s YTL Power Generation win US$125 million in an UNCITRAL claim against Malaysian state oil and gas company Petronas in 2015 in a dispute over gas payments lasting nearly two decades. The case was heard in Kuala Lumpur by three retired UK Supreme Court justices. The firm also secured an award in favour of a Central Asian state-owned bank in a US$600 million ICC arbitration with another financial institution concerning a billion-dollar fraud. Another win came for Swedish financial group SEB in a £50 million SCC arbitration arising from the purchase of a life assurance company. The firm won damages for SEB and is now advising on enforcement of the award in Greece. The firm’s most high profile instruction continues to be acting for a Canadian subsidiary of Repsol in a US$5.5 billion SIAC claim brought by China’s Sinopec concerning an investment in a Scottish offshore oil venture. It is also working on a number of commercial disputes for clients based in Hong Kong. These include acting for an investment firm in a HKIAC arbitration, an investment fund in an ICC arbitration relating to fraudulent misrepresentation claims and another entity in parallel LCIA arbitrations concerning Chinese tax issues. A leading insurer is using Slaughter and May in a Singapore-based ICC dispute arising from the sale of one of its businesses in Asia. The firm also reports working on the enforcement a US$100 million arbitration award in Cypriot courts. Holly Ware, one of the Slaughter and May team representing Repsol, was promoted to partner in London. In Hong Kong, Kevin Warburton was promoted to counsel.